I just finished reading maybe the best Spread Offense book; Spread Formation Football by Coach LR “Dutch Meyer published in 1952. Coach Meyer was the Head football coach at TCU in the 30s, 40’s and 50’s. He and his staff created the original Spread Offense used today. You can read his bio to the right. The Spread Formation Football book outlines why the Spread Offense works and how it was effective for TCU. Coach Dutch reviews the two base Spread formations; Basic and Normal. Basic is a double to one side and trips to the other. Normal moves the FB below the TB and looks like a traditional Double Double Spread. What is interesting about this first form of Spread is that what we think of a Quarterback was really the Tailback. The first Spread formations were what we call in the modern era Wildcat since a “true modern” QB is not used in this early variation of the Spread Offense. The TCU Spread Offense was a running offense but with equal parts of passing. “The spread tailback must be a passer. As observed before, the threat of the overhead attack must be constant if the Spread attack is to operate effectively.” writes Coach Dutch in his section on the Tailback position. The TCU Spread evolved from the wide Double Wing Offense into the Triple Wing into a passing triple and double wing. The TCU Spread was not an Air Raid but lays the foundation for the upcoming passing revolution in modern football. I have run variations of the Spread Formation a few youth football seasons over the last 24 seasons, when I had the right talent and skills to do it successfully. I’ve run a Wide Double Wing in the Spin / Double Wing variation I call Speed and the Beast Jumbo is a overloaded Triple Wing Spread formation. These Spread like formations have been effective for my youth football Offenses when I had tier 1 Speed at TB and or Wings and a very good shotgun Center. I was not able to run Spread effectively without Speed and a great consistent Center. In the book, Coach Meyer talks about the player profiles needed to effectively operate his TCU Spread. First, the Tailback (Modern QB) must be rugged, fast, intelligent and a good passer. He says the TB is the “soul” off the Offense. Basically the TB is a stud because he wants the TB to be a “natural runner” and a passer. So you need a Sammy Baugh / Dak Prescott in your backfield to run the Spread effectively. And I tend to agree. Your QB / TB position must be a tier 1 stud to really run the Spread Offense. He must pass and run like a man child if you want to run the Spread in youth football and for that matter in HS. I was surprised to find out his Guards must be top linemen with serious speed to pull outside for sweeps. “On them will depend the success or failure of almost every operation” say Coach Dutch. He says he wants Guards that can MOVE and THINK. Speed over strength in the Guard positions. The FB must also be a pretty good runner for the Spread to work. The FB is going to carry the short yardage plays. Your Center must be a stud because sometimes he will pull. His snaps must be perfect and know how to long snap, medium snap and short snap to the FB either Left or Right. The Slots or Wings can be average but must be good receivers. Tackles are basically regular tackles and the Ends must be able to block in the open field and catch the football. The book goes over many run and passing plays from the TCU Spread against a 5 or 6 man front, which is great for youth football coaches since youth football coaches will see these fronts. He also reviews the umbrella secondaries common for the TCU Spread at the time. I loved the theory and strategy of the Spread Formation Football book I think it outlines exactly what I have been saying you need to run the Spread effectively. You must have a passing threat to run the Spread effectively. Just lining up in the Spread does not mean you have a passing threat. I’ve watched a ton of youth, middle and high school football games, and the teams should never run a Spread formation the whole game since they did not have a stud QB, great pulling guard, stud FB or anyone that could catch. There was no passing threat, so those offenses were shut down immediately by Defenses that did not respect the Spread. I have also faced stud Spread QBs and receivers that shredded me and others for an entire season. I have also shredded teams with my Spread when I had the talent. If you are interested in the Spread Offense or trying to defend against the Spread Offense I recommend this book. I enjoyed the book and the theory of the TCU Spread. I will be using some of the info both on Defense and Offense. The book is a little pricey since its out of publication. I found mine on Amazon for $95. 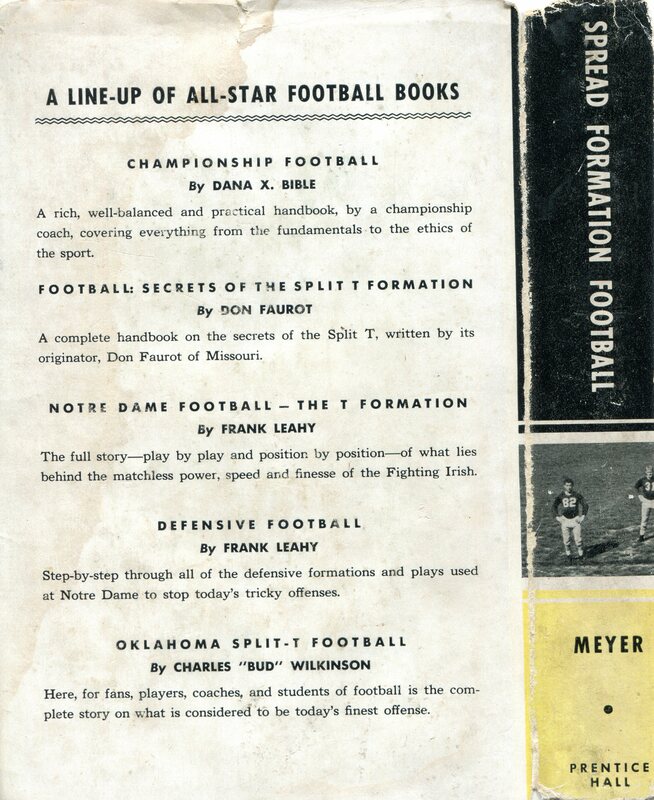 Spread Formation Football by Coach Dutch Meyer, 1952. If you have read the book or run the Spread, I would love to hear your thought below in the comments. Remember to Play for Fun and Winning is Funner. This free coaching video reviews Installing the Power Wing Beast Offense for Youth Football by Coach Parker. The Beast offense is easy to install and has its Base 8 youth football plays to install from the Power Wing Beast Offense playbook. The Power Wing Beast Offense is a power running offensive system based on the Single Wing Beast formation that was run by Yale in the early days of football. It is a great youth football power running formation. The Base 8 Plays are Beast formation plays. Check out the video below for more detail on how to install the Power Wing Beast Offense for pee wee football teams. Stay tuned as I develop more free coaching videos on the Power Wing Beast Youth Football Offense from my pee wee youth football playbook. Many of these power running plays are run by the top little league tackle teams across the Country in some of the best youth football associations. Subscribe to my blog or YouTube channel to find out more about the Beast Offensive Formation and coaching youth football in little league tackle leagues across the US.